Anyone know about the turntable in Utica just off RT 5 in Utica. It was in between RT 5 and the CSX main just West of the NYSW shop. It was a few years ago and in the trees, but the turntable was still there. I was getting off Rt 12 onto 5 on Sunday ( table was just a few hundred feet to your west as you get off ramp. It appears the lot area was being cleaned up and the table looked like it was gone ? The cement stand that held the power cables to the table is still there but it looks like the table is gone. Anyone know more ?? Hope it didn't get cut up. Anyone know how long it is or was ? Is this it? -- I had to look at the picture twice before I saw it. there was once a roundhouse too..
been there probably 100 years or so, more or less..
Not sure the exact age of the Turntable, but it is still there, only in the past couple years lots of bulldozing and hard-fill dumpung has been done in that "ravine" so I'm not sure if it was damaged or not. Here is a photo of the turntable in operation in the 1970's. Photo by Gerry Coyne, courtesy of RR-Fallenflags.org. The original table was installed in 1906 and I think was an 80 footer. It was built when the roundhouse was built at the same time and the engine service facility and roundhouse moved from the old UC&SV location further to the east roughly behind Potter Street school. In 1928 the table was enlarged, perhaps from the former facility at Hallstead, PA with a 90ft table to accomodate bigger engines. 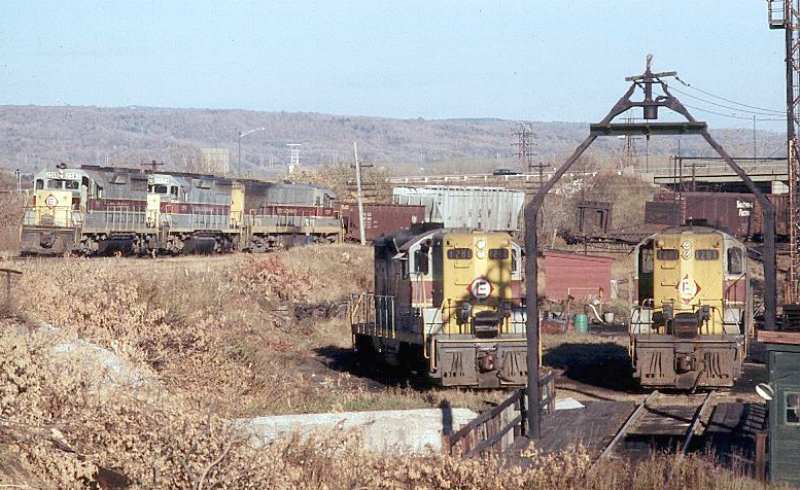 Hallstead was closed and operations moved to the "New Yard" at East Binghamton. The last use of it was April 1982 two days before NYS&W took over the facility and line to Binghamton from Conrail. About 10 years later there was an abortive attempt to reactivate it when NYSW bought steamer 142, but the work was never completed and the table never turned. It has sat in neglect ever since. The roundhouse was torn down in August 1980 and backed directly against Oriskany Boulevard. The old facility behind Potter Street had a fairly extensive shop and actually assembled new locomotives, 10 having been documented as built new there and was complete with a transfer table. However it was a cramped facility with the old cemetery, NYO&W facility and the DL&W yard all in the same area and room was needed to expand. DL&W had a coaling facility at the new site just north and west of the turntable and for many years serviced steam and later diesel power there. In fact the now preserved DL&W camelback #952 made many trips over the turntable and spent much time in the Utica Roundhouse as it was the protect passenger power for many years at Utica and made its last trip south CA Dec 1937 - Jan 1938 from that roundhouse and turntable. EL continued to use the service facility but rarely the roundhouse other than one bay on the northend and the roundhouse offices where the engine crews reported for duty. Most of the area was later leased (or sold?) to Abe Nathan as a scrap yard. Conrail continued to use the table but only used the sanding / fueling facility for a very short time. What is little known was that New York Central had an agreement to use the table to turn cars or locos after they dismantled their turning facilities, later PC used it. One of the last times I saw it used was the Lyons Falls crew turning a U25B in late 1981 or early 1982. Then the last use in April 1982 when I had the pleasure to ride the engine (an ex PRR GP-9) around but had run out of film other than to record the engine on the table. My plan would have been to shoot out the cab window as the table spun. Yes that picture is the table I'm talking about, if you look at the picture at 5 o'clock you can see the cement pole I'm talking about that held the power cables. As I said before, I've been there and knew where to look. I looks like the table is gone as of Sunday, lots of heavy equipment in the site. Hope I'm wrong and trees were just to big, but I think it's gone. Will check over the next few weeks. Cactus do you know who owns this property ?? Table would be nice in Thendara or anywhere in service. As I recall the table wasn't in bad shape, just missing motors. As far as I know it was the property of NYS&W. A call to Cooperstown would probably clarify it. The centerbearing was bad and I don't think the motors and guide wheels were there or they were not complete with bearings missing etc. The whole thing needed alot of work, even years ago. I just realized, I don't think the sand tower is there anymore either. Not sure when that disappeared. Scrap is up, so it wouldn't surprise me if they ripped it out and cut it up. But they had cleaned out a road down through there in the past few months, and the neighboring limo outfit tore out a coal trestle just west of the main track, in the last year or so. Table was pretty well grown over, though, lots of trees and crap growing down there had it just about invisible unless you stopped and got out of your car to have a good look. Cactus Jack wrote: As far as I know it was the property of NYS&W. A call to Cooperstown would probably clarify it. The sand tower was scrapped some time between November 2004 and January 2005. It was done by the scrapping crew that cut up the 3612, the ex D&H Jordan Spreader, and a few passenger and freight cars in the Utica yard. I was working in the Utica shop at the time, but I wasn't really involved with the scrapping process as I was an electrician. At the time I lived in Yorkville so I drove past the tower every day going to and from work... it took me a little while to realize it was missing, but I was informed that they had scrapped it when I asked about it. Went by there in Dec. and it didn't really look any different than it had before, I would think if the table had been torn out for scrap that whole area would be fairly well cleared of brush and so on and it wasn't. If you haven't looked at OpenStreetMap, it's an excellent resource for mapping railroads (in spite of the "street" part of its name). http://openstreetmap.org/ -- feel free to ask me any questions about it. And ... Happy New Year! I was there early Saturday morning (sorry I didn't let you know I would be in town, Cactus Jack, it was a short-notice trip), and I saw no sign of it. Sorry to hear it is now gone. I hope is was not scrapped. Give a heads up next trip !